Houghton Mifflin Harcourt, 2015. 96 pages. Nonfiction in comic book form is an idea whose time has come. What could be more memorable? Do you want to teach history in a way kids will pay attention, absorb, and understand? In fact, speaking for myself, this is a way adults can read it and absorb much more information than reading regular text. 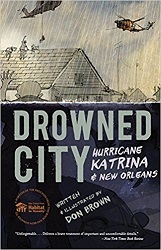 Now, the story of Hurricane Katrina is not a pleasant story at all. This feels more hard-hitting than The Great American Dust Bowl, since the people involved, including those who bungled the response, are still alive. Though both stories are horrific. And the reader can understand that better with the graphic illustrations. Don Brown uses a variety of panel arrangements and colors to keep interest high. Leafing through the pages, you get a sense of action. One ruined neighborhood, the lower ninth ward, is overgrown with plants and weeds and has just 15 percent of the population it had before Katrina. But new houses are going up, built atop deeply driven piles, giving them firm roots to stop them from floating away during the next Katrina. The man setting the piles is a “born and raised” New Orleanian. In this volume, Phoebe releases Marigold from the wish that made Marigold Phoebe’s best friend – and discovers Marigold wants to be her friend anyway. Phoebe faces normal kid things – such as wanting a part in the school play and competing in the school spelling bee against the boy she has a crush on. But she also faces things unique to someone whose best friend is a unicorn who is convinced she’s the best thing in the universe. 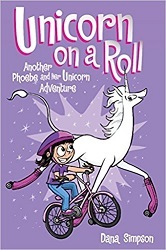 One nice sequence is when Phoebe gets to go to the land of the unicorns for a party – when the unicorns decide to hold an intervention, trying to convince Marigold to stop being friends with an icky human. They are unsuccessful. This comic strip is all that a comic strip should be – inventive, funny, true to life, and with insights about life that sneak up on you. Source: This review is based on my own copy, sent by the publisher. Candlewick Press, 2016. 216 pages. Here’s another amazing graphic novel by Matt Phelan. I’ve loved his art ever since I saw it in The Higher Power of Lucky, by Susan Patron. 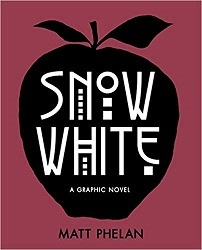 This is a retelling of “Snow White,” set during the 1920s and 30s in New York City. Who knew you could fit Snow White into such a setting? And it’s beautifully done. Samantha’s mother gets drops of blood on the snow not from pricking her finger on a needle, but from her cough with drops of blood. Ten years later, her father meets the “Queen” of the Ziegfeld Follies. Instead of running into the woods, Samantha runs into Hooverville, where she’s helped by seven boys who won’t tell her their real names. The stepmother seems to have some sort of magic. And she’s very good with poison. The story is told with very few words – in fact, at times I would have liked more to tell me exactly what was going on. It’s possible I was being lazy and not paying enough attention. But whether or not I caught every detail – this story is striking and wonderful. Now here’s a twist on the fairy tale that I’ve never seen before. Clarion Books, 2017. 188 pages. One of my favorite children’s fantasy writers Donna Jo Napoli has teamed up with the amazing illustrator David Wiesner to produce a gorgeous graphic novel. The story is about a young mermaid who is kept in captivity by a man who calls himself Neptune, god of the sea. The building is next to the ocean, and the man puts on shows for tourists. Fish Girl’s job is to let the tourists get glimpses of her, but never a good look. And she picks up the coins they throw into the tank after the show. Then a 12-year-old girl sees Fish Girl. She’s afraid Neptune will find out. But the girl comes back, and the two become friends. 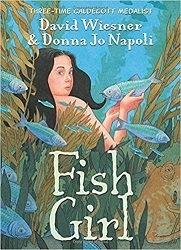 Fish Girl starts climbing out of the tank at night – which changes things. She begins asking questions about the stories Neptune has told her. There are a lot of unanswered questions in this graphic novel – the story is mostly told through the pictures. But the story is gripping, and the pictures are stunning. And we’re rooting for Fish Girl as she makes a friend and gets a name and starts thinking about freedom. The amazing true story of the woman who became The Motorcycle Queen of Miami! Fulcrum Publishing, Golden, Colorado, 2016. 122 pages. I think that nonfiction in graphic novel form (okay, necessarily fictionalized a bit) is one of the best things that could happen to education. Joel Christian Gill has started a series about remarkable African Americans, telling their amazing stories in comic book form. I’d never heard of Bessie Stringfield, but she was the sole woman in the U. S. Army’s civilian motorcycle courier unit during World War II, and the first black woman inducted into the American Motorcycle Hall of Fame and the Harley Davidson Hall of Fame. The book begins with her childhood. After her family moved to America from Jamaica, her mother died and her father just abandoned her in their hotel room. The book tells about her unusual upbringing after that and how she grew a passion for motorcycles and traveling. She traveled across the United States eight times, and ended up doing lots of traveling in the Jim Crow South. (I like the way the author pictures bigoted people in this series as giant crows. It’s disturbing, as it should be.) She had run-ins with people who wanted to harm her, but was always able to outrun them on her motorcycle. The story of her varied exploits is a quick but very entertaining read. 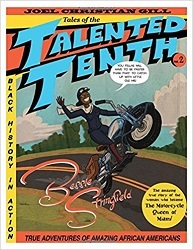 And you’ll learn about someone who deserves to be remembered, the Motorcycle Queen of Miami, Bessie Stringfield. Andrews McNell Publishing, Kansas City, 2014. 222 pages. I was sent some later volumes about Phoebe and Her Unicorn and realized at last what I’d been missing. I’d even had this first volume checked out, but never cracked it open. A little vain . . . Marigold would be an appalling monster of ego, utterly self-concerned and completely unlikable, if it weren’t for her sense of humor and her occasional surprising capacity for compassion – both crucial attributes when bound by a wish granted to a nine-year-old girl in need of a Best Friend to play invented superhero games with, to introduce to slumber parties and girl-talk gossip and to ride through the wind after being called nerd and Princess Stupidbutt one time too many. For Phoebe is a remarkably real little girl, as bright and imaginative as Bill Watterson’s Calvin, as touchingly vulnerable as Charles Schulz’s Charlie Brown. And if these strike you as big names to conjure with, I’ll go further and state for the record that in my opinion Heavenly Nostrils is nothing less than the best comic strip to come along since Calvin and Hobbes. Simpson is that good, and that original. And yes, he’s right — Phoebe and her Unicorn is in the tradition of Calvin and Hobbes, this time with a nerdy and precocious little girl – so perhaps I related a little more than to Calvin. It helped me enjoy the book more once I realized this is a comic strip collection. There is an ongoing story, but most of the strips end with a joke. And they’re good jokes! (Okay, I like the unicorn puns about Phoebe being pointless.) It helped me enjoy reading them more when I realized what I was reading. There is an ongoing story. But there are also comic-strip traditions in play. For example, Phoebe is a fourth grader at the start of the book. Then she has a lovely summer off and goes back to school – and starts fourth grade. And like other great comic strips, there are profound observations behind the jokes. 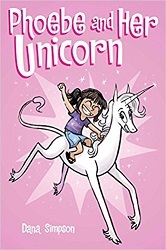 This is a lovely book about a nerdy little girl who wants to be awesome, about a unicorn she rescued (by hitting her with a rock and breaking her out of the cycle of gazing at her own reflection) who granted a wish by becoming her best friend, and about a unicorn who is well aware that she is the loveliest thing on the planet. Henry Holt and Company, New York, 2016. 64 pages. 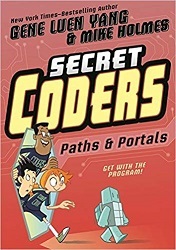 Here’s a graphic novel just right for kids who are ready for chapter books. It’s by the brilliant Newbery-Honor-winning Victoria Jamieson. That’s how long I’ve been stuck in this terrible prison, otherwise known as . . . I was captured along with my friends Barry and Biter. I haven’t seen them in months. We’re being held in separate cells. GW has devised a clever plan to escape, including an elaborate contraption to get the door open. When he escapes one night, he goes to rescue Barry, a rabbit, and Biter, a guinea pig, as well. Barry’s the first grade classroom pet, but he seems to have gone soft in prison. Still, when GW breaks him out, he goes along. She’s . . . she’s doing hard time in the worst cell block in this place. Her jailers torture her nearly all the time with stupid songs and crazy behavior . . . .
You don’t mean . . . Yes, I’m afraid I do . . . .
Well, that’s the beginning. GW and Barry do convince Sunflower to come along, on the strength of their friendship. 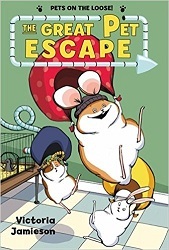 But then they meet the fourth grade class pet, Harriet, and her mouse minions. Harriet is planning to sabotage the school lunch. What follows is a grand and dramatic food fight. Classroom pets on the loose! Jokes about school! Mayhem in the school cafeteria in the night! All in graphic novel format! There’s not one kid you’ll have to coax to read this book. And best of all, it shows all the signs of being the first book of a new series, Pets on the Loose! Graphix (Scholastic), 2017. 220 pages. This graphic novel is a pleasant sequel to Sunny Side Up. Sunny’s now starting middle school, which is tough, but most of the tension in the book comes from the difficulty of adjusting to her older brother being sent away to boarding school. When he comes home for Thanksgiving and Christmas, the whole house is full of tension. The story’s set in 1976, which was when I was in eighth grade myself. So I especially enjoyed the seventies’ touches such as Pet Rocks, seventies’ décor, and TV shows like The Six Million Dollar Man. 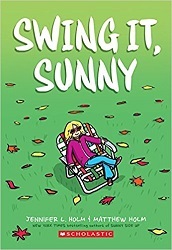 The authors keep a light touch, mixing fun diversions – like a new next-door neighbor teaching Sunny how to swing a flag – with worries about her brother. You’ll enjoy it a little bit more if you read the first book, since you’ll appreciate Sunny’s interaction with Gramps and her fondness for the alligator Big Al. But even without that, you’ll still have fun with this book. It all adds up to a truly delightful and hopeful graphic novel. Razorbill (Penguin Random House), 2017. 144 pages. This gorgeous graphic novel turns the story of the Pied Piper of Hameln into a tragic romance. It’s also a story of prejudice and greed – but with love rising above that. And we find out that the real story isn’t the one we’ve heard. This version of the story features a deaf teen girl named Maggie who lives in Hameln with an old woman, something of an outcast. She can read lips and talks with the piper, a handsome teen himself. She learns his story, as no one else does. Maggie enjoys writing stories with her caretaker, an old woman named Agathe. She writes the stories of the villagers the way they should be told. 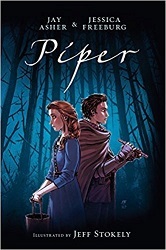 Did the villagers deserve what they got from the Piper? What if the revenge the Piper took was different than the story we’ve heard? This book is a quick read but a haunting and poignant tale. The ending especially will surprise you. You are currently browsing the archives for the Graphic Novel category.